CEO's keep talking about innovation. There isn't any game without it they say. But there is no clarity on what this new elephant in the room is like? 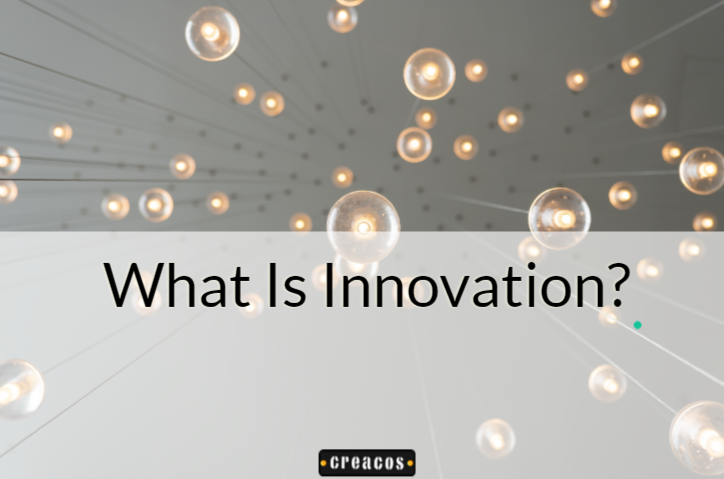 So, what exactly is innovation? What does innovation mean? As a corporate creativity blogger, my focus is not on the academic definition. Here I am explaining the idea of innovation in the business and corporate scenarios. So let us dive directly into what does innovation mean in business scenarios. 1: Innovation as improvements in technology and processes. 3: Making technology useful and available to a larger audience. 4: Business model innovation for getting the competitive advantage in the marketplace. 8: Social innovation: Though not business related, it is often talked about in business circles in relation to CSR activities of organizations. Innovation is always about changing 'something'. We take something existing and change it for better results. It is about ideas to improve the existing solutions. These ideas could be small or big in themselves, but they change the products, services and market behavior in significant ways. This 'something' could be a product, a process, a social situation, or the way we do our business, run our organization. So, is an incremental change in the product, service, process, or situations an innovation? No. An emphatic no. Many people use 'innovation' as a synonym for any new improvement. It is used as a buzzword. And is often meaningless. Let there be no confusion here. Innovation is about introducing something new. Newness is an important parameter for innovations. But the 'new improved' is not innovation. There must be a significant change. Changes which are non-linear, not predictable. The significant change is the first requirement for calling something innovation. Which means dramatic improvements in productivity, lowering of cost to a level where competition becomes irrelevant, or the evaluation parameters of the industry suddenly change. That's why innovations are disruptive. And game-changers. They shake-up the status-quo. Break business and industry assumptions. Innovation also demands new infrastructure, support system, and skill-sets. These changes often involve technology breakthrough. And result in radical changes in industry benchmarks and practices. It is not just a change in technology or process or a product. It changes the way the market behaves, industry leaders re-think their evaluation parameters, customer's expectations change. Innovation creates new opportunities for entrepreneurs. New product categories, platforms, and business models appear. We can say, innovations are not just an incremental stretch of a progressive straight line. It signifies a bend. And a leap up. Innovative changes are not just evolutionary, but revolutionary in nature. Nokia was a proactive company. it consistently upgraded their phones. Regularly introduced new features. These were incremental changes. Not exactly innovation. These could be called new and the improved versions in their product line. Smartphones were an innovation. It changed the industry. It raised customer's expectations. An innovation wave was triggered, new business opportunities were created for entrepreneurs as the app-makers started developing new applications to make the smartphones even more user-friendly. It's not possible to define innovation without factoring in-- usefulness. Innovation is about significant changes to make a new idea or technology useful. Throughout the world, many inventions happen in scientific laboratories. While the scientists appreciate these new ideas and inventions, awarded for the efforts, the common people can't use these inventions. Until and unless someone cracks a way to produce an invention on a large scale, and at a cost affordable to people, and make it user-friendly so that people can actually use it in their lives, it is of no use. Till then it remains only in the laboratories and the patent books. Computing technology was there in the world for a long time. Only universities and big corporations were using it. Entrepreneurs like Steve Jobs and Steve Wozniak brought that technology to use for common people in the market. They created the user-friendly screens, icons, introduced mouse and made computers useful to a large number of people outside the academia. 3-D and Nano-technology are in focus right now. Drones and their potential uses are exciting the innovators throughout the world. They are working on innovative solutions to bring it to the market. To make it available to people. A whole new innovation wave is waiting to surge up and influence the lives of people. And the truth is, 3-D technology is not new, it was there for decades. More than 40 years! This journey from invention to the practical solutions in the market is the innovation in its purest form. There are many inventions, patented but not serving mankind. Innovators apply their vision and skills to bring it to the masses. Now this journey might mean many new inventions. Creation of new machines, devices, applications. It also involves connecting the dots between available resources and solutions, developing and packaging them in such a way that these technologies become useful and add value to the life and business of the users. Innovation adds value. Real value. Their impact is felt not just on the business and the market, but also on the healthcare, lifestyle, and the financial well-being of the society. Innovators create a better future by making the present more productive and useful. ​Product innovations are talked about the most. Because these often accompany marketing and advertising hype. Product innovation happens through new product developments or bettering old products by making them more useful. Process innovations often are in the background. And many times even shielded from the outside world. Because these improved processes give the cost and productivity advantage to the organizations. Though many times organizations choose to talk about it. And share it with others. Business model innovations are often less talked about. But its role is vital in the innovation game. Innovation in the business model makes sure the radical ideas are successful in financial terms as well. Because while everyone talks about the customer value creation, business models take care of the value creation and retention for the business. These involve major changes throughout the organization. That's why we see more activity on this front in the entrepreneurial businesses where things are fresh and under control. With the advent of new technology and the digital economy, new business models are emerging. The business model decides which companies will remain profitable and dominate the marketplace in the long run. Business model innovations often involve marketing innovations and financial innovations as well. New players like Uber and Ola are in the same old business of transportation. But the way they serve the customer is different. They manage resources differently. That expands their fleet and reach faster than the traditional transportation companies who invest heavily in the capital. Many other entrepreneurs are adopting the 'freemium' model for customer acquisition. 'Software as a service' is gaining ground fast with cloud technology innovation. Organization culture plays a big part in making the innovations possible. The way communication flows in an organization has a major impact on the innovation output in any organization. Even appraisal and evaluation parameters must change. This means the organization must go through many changes. Many companies talk about innovations. They even have innovation as one of the core values. But they neglect the organizational innovation part of it. Creating some new products alone can't give a competitive advantage. Organizational innovation is a must to deliver the innovation edge. Business houses play a vital role in innovative solutions. Because while the inventions can happen in secluded laboratories, innovation involves a lot many forces. The infrastructure and financial muscles of organizations make innovation possible. They also have the manpower and the managerial competencies to bring solutions to market. Inventors often lack these qualities. Innovations can give a competitive advantage to the organizations. But, they still resist innovations. Innovations are not accepted easily. Because it obsoletes many old resources and assets. The businesses must create new competencies. They have to look for new vendors. Incur their resources in new technologies. It's hard work! And the old market leaders lose their position of power. (Their cash cows become a liability!) So there is every bit of effort to discredit the new developments. Also, in the beginning, the innovative solutions are in their primary stage and face teething problems. This becomes a good ground for the critics and naysayers. That's why many times the leaders don't pursue the innovative solutions created by their own research and development teams. They keep on investing and developing the old solution. And later they suffer when competition challenges them with the new paradigm. Innovation is no more an exception, but a norm now. That's why business leaders are pushing their organisations to take innovation seriously. It's better to create the next big development and reap the rewards than to chase the disruptors and lose the market leadership. Innovation: Talking Is Not Enough! A brilliant depiction of the innovation paradox by Timo Elliot. Innovation is not an incremental change. It is about changing the status quo. Something new, which is not just an improvement but a leap. Often a sideways leap! The innovations help bring inventions to market by making large-scale production possible. Innovators also ensure the products and services are affordable and useful to the users. The business model innovations are needed to gain the value for the organization. It also involves financial and marketing innovations. To gain the competitive advantage businesses must work on the organizational innovation. Though, it is often ignored. Share Your Innovation Story With Us! Feel free to connect with us. Share your success stories, we will publish it.